Glenn has been training with kettlebells for more than fifteen years after serving as a US Marine, and has certifications from World Kettlebell Club (WKC), Russian Kettlebell Challenge (RKC) and ACE. He has trained with world-class athletes Valery Fedorenko and Catherine Imes. Glenn's unique teaching approach to kettlebell training focuses on flow which, along with fitness and function, give F3 its name. At F3 Wellness Connections, rated best kettlebell workout by the Washington Post, Glenn and his team offer a progression program for new clients to advance their kettlebell practice through four stages, called the Path of the Warrior. For advanced students and local trainers, Glenn offers DC's only kettlebell certification program, The VonSeth Method. He is also a licensed massage therapist with over fifteen years of hands-on training and experience in top spas in and around DC. Sarah was born in Paris but grew up in Cote D’Ivoire (her country of origin) and France until moving to the USA in 2008 to continue her studies. She became a strong advocate for fitness and wellness after she decided to adopt a healthier lifestyle six years ago, which resulted in a significant weight loss and drastic improvement in her health and wellbeing. Sarah was introduced to kettlebell training and the health and wellness industry by her husband Glenn in 2013 and it automatically turned into her passion. Having witnessed the life-changing effects of kettlebell training, she was inspired to use her business management background to assist her husband in growing their family business and sharing the tremendous mental and physical benefits of fitness training and massage therapy with their community. Sarah holds a bachelor’s degree in Business Administration from Temple University and a Master of Business Administration from University of Maryland University College. She is also a Hardstyle Kettlebell Certified (HKC) Instructor. She loves traveling and discovering new cultures with her family and is dedicated to raising a healthy, happy daughter. Danny is a certified F3 coach and Hardstyle Kettlebell Instructor. He has trained under Master Trainer Glenn Seth since 2011. He has a B.A. from George Washington University in Political Science. He was inspired to take up kettlebells as an enthusiast of author Tim Ferriss' books on entrepreneurship, learning, and fitness. 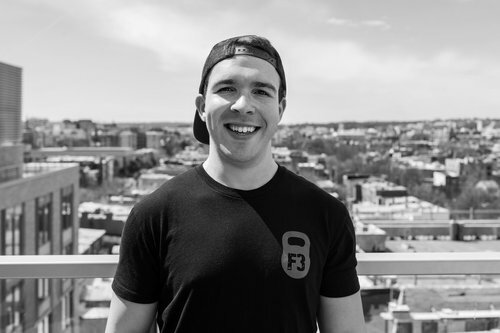 The efficiency of full-body kettlebell workouts in improving functional strength and producing rapid fat loss inspired him to become a regular at F3 for more than two years before becoming an instructor. Danny enjoys presenting clients with new and exciting challenge through consistently varied workouts. Simone began practicing yoga after years of college sports. In yoga she found peace that hadn't been replicated in any of her other physical pursuits. The mindfulness of yoga practice provided a foundation to cope with her anxiety and depression and brought her to a place of gratitude and presence. She believes that a strong connection between mind and body enables us to appreciate the gift of each present moment. A D.C. native, Simone hopes to share the light and solidarity of yoga with her community and her students. She teaches a slow-burning, earthy flow with plenty of soul and always, always pigeon pose. Emily Szajda, writer, chef, yoga and meditation instructor and sports nutritionist left “Corporate America” for an entrepreneurial life focused on finding more work/life balance in Europe. Emily began her journey into self-awareness and spirituality merely by the physical practice of yoga, but overtime her practice evolved into much more. After graduating from ASU with a Bachelor’s degree in History and Geography in 2010, in addition to having degrees in culinary arts and hospitality management, Emily felt driven to share the beauty of yoga and meditation with others. Inspired by one of her early instructors, Vivienne Sio Tarquinio, she completed her 200-hour RYT in June 2011 in Scottsdale, Arizona at At One Yoga sponsored by Life Power studying under renowned yoga instructors, Jenn Chiarelli and John Salisbury. She also earned her 85-hour PRYT in Italy in 2017. Yoga was introduced to me when I attempted to take a spin class. 2 minutes into the warmup I quickly realized spinning was not for me. I stumbled into my first yoga class and loved it! Once I was ready to make changes in my life and accept the benefits, yoga became a part of my daily routine. I turned to teaching during a rough period in my life, as a distraction. I enjoy teaching a vinyasa/power flow to fun energetic playlists. I enjoy challenging people to either go deeper in their practice or stay exactly where their body/mind/life positions them. Shelley provides therapeutic massage to address soft tissue injury and dysfunction, chronic pain, and stress management. As an experienced therapist, she listens and tailors your session accordingly. Shelley specializes in Swedish, Deep Tissue, Myofascial Release, Trigger Point Therapy, Precision Neuromuscular Therapy, Reflexology, and Aromatherapy. She also has had training in Oncology Massage and Advanced Soft Tissue Therapy for TMJ and Dysfunction. Robin is an intuitive therapeutic certified massage therapist Licensed in Washington, DC. She graduated from PMTI in 2004. She is certified in Hot Stone Therapy and has completed courses in Cranio Sacral and Trigger modalities. She also completed the Compassionate Clinical Service: Oncology / Hospital Massage Intensive course. Michael Clarke has an innate and lifelong love of massage therapy and he wants to share it with you. A longtime student of fitness and bio-mechanics, Michael Clarke graduated from the Northern Virginia School of Therapeutic Massage with over 600 hours of study and clinical practice in deep tissue, sports, Swedish, trigger point release and hot stone massage methods. Chef Lauren Williams is a DC native who found his passion for cooking in his grandmother’s kitchen. Growing up on Capitol Hill, if he wasn’t playing with his brother and friends in the neighborhood, then he was in the kitchen learning. And from there a gift was born! Chef Lauren attended Liberty University where he played football and majored in communications. Upon graduating, he went on to play professional football in the NFL. He signed with the Oakland Raiders and was allocated by the Raiders in 2007 to play in the NFL Europa league for the Rhein Fire. However, after an extremely short career, he went back to his passion for food. more experience and hands on knowledge within the culinary industry. His experience then landed him a position with a company contracted by DC Public Schools where he serviced school cafeterias across the District by providing healthier meal options for kids. After his time as Executive Chef with the school district, Williams became the personal chef to John Wall, the starting point guard for the Washington Wizards. Williams has also been a contestant on Food Network’s reality show Cut Throat Kitchen. Over the years, Chef Lauren’s passion has shined through his work but even more so on every plate he’s touched. His true loves are food and the art of servicing others. At the age of 20 Miguel Lara joined Marriott Hotels and Resorts where he spent 15 years learning all about food and beverages in different properties in the City . He was an apprentice at the University of Maryland university College Marriott conference Center for Chef Patrick Hutchinson, where he learned and master French cooking techniques in 3 different restaurants. In 2006 Miguel Lara graduated from the school of Gourmet Cooking Catering in Atlanta Georgia. He became a food Safety instructor in 2007 for the National Restaurant Association education foundation. He has been teaching Food Management at Montgomery College Rockville Campus since 2008. He is also the Chef director Of Taste Of Peru Washington since 2011. He has been the private chef for Baruck Weiss Assistant US Attorney. In 2013 he founded Chi’bal Restaurant Laurel Maryland for which he designed the menu. The places Miguel has been and also cooked include: Panamá ,Colombia ,El Salvador Salvador, Argentina. Austria, France, Hungary, Czech Republic, Spain, Morocco, and Mexico. Anna Hall is a native of the beautiful country of Armenia. she obtained her certification as Master Esthetician, specializing with advance clinical skincare, chemical peels, microdermabrasion and lymphatic drainage from the Esthetic Institute of Virginia. She takes the time to analyze each individual of their skin textures and skin care concerns. Then she customizes a treatment plan that will help best each client. To achieve this, Anna utilizes and combines only the best natural and organic products of various brands that provide actual results. She does not rely on a brand’s entire product line, rather she researches, identifies and utilizes only the products that have proven successful. She also specializes with various skin care technologies including European-sourced microcurrent, radio frequency, and electric muscle stimulator (EMS) machines. Anna focuses on each client’s specific needs, combining both technological skin care treatments and the best products available. Under Anna’s care, customers discover effective preventative, anti-aging and nourishing skin care. Nikky is a graduate of the Pennsylvania State University, where she earned a Bachelor of Science degree in Nutrition with a minor in Kinesiology. She subsequently completed her dietetic internship through Cedar Crest College, where her work experience included rotations at Penn State Sports Nutrition, UPMC Altoona, and Penn State Cooperative Extension. Nikky is both a Registered Dietitian (RD) and a Certified Personal Trainer (CPT) certified by the National Council on Strength and Fitness (NCSF). Additionally, Nikky is a member of the National Physique Committee (NPC), the Academy of Nutrition and Dietetics (AND), and the Sports, Cardiovascular, and Wellness Nutrition (SCAN) dietetic practice group. Nikky specializes in nutrition counseling in several areas, including sports nutrition for amateur, high school, and collegiate athletes; medical nutrition therapy for diabetes, obesity, hypertension, and eating disorders; and general healthy nutrition for individuals looking to gain muscle, lose fat, or attain optimal health and vitality.